This post is about a writer, performer and librarian who impacted my life, PURA BELPRE [1899-1982]. For Hispanic Heritage month I want to recount the stories of incredible dreamers and doers, Hispanics who made a difference. When I heard about the earthquake in Mexico City I put everything down to connect with family and friends in my hometown, some who have lost their homes. The loss of life and destruction to property is overwhelming. Despite all they have been through I heard something familiar in their voices. Something I have always known about Latinos. We are RESILIENT. Let’s face it, this year Hispanic Heritage month feels different. We’ve been bullied with all kinds of bad names and labels. Hispanic communities are under attack with racial profiling, moves to eliminate affirmative action and aggressive immigration policies designed to bring fear and confusion. Instead of building bridges of understanding all we hear about is walls. Despite the steady stream of negative tweets and taunts, genuine pride in Hispanic heritage does not falter. As a people we Latinos are resilient, we know how to pick ourselves up, rebuild and never quit. That’s why it is more important than ever for a simple idea. All children have the right to see themselves in the pages of books and hear stories that inspire, challenge and lift them up. Stories they can relate to. That brings me to our heroine PURA BELPRE. The amazing librarian, activist and storyteller who traveled all around New York, zig-zagging from the Bronx to the Lower East Side. Wherever she went she brought along puppets to tell stories to children in Spanish and English. Today I’m sharing illustrations of Pura from the book BRAVO! Poems about Amazing Hispanics, written by Margarita Engle. When she arrived from Puerto Rico to attend her sister’s wedding she liked New York and decided to stay. With dreams to become a teacher, her first job was in the garment industry. Her language skills, community spirit and literary skills got noticed. Public libraries needed young women with determination and skill to reach out to diverse communities. Families who spoke Spanish at the time, wouldn’t send their kids to the library because they believed it was only for children who spoke English. She went to the Library School at the New York Public Library in 1925. Pura was exceedingly clever, a groundbreaker who knew how to engage and delight children. She had gifts and heart and knew how to encourage them to read and fall for books the way she did. She was the first Puerto Rican librarian in New York City. An organizer and advocate she set up bilingual story hours, bought Spanish language books and created library based programs focused on Spanish holidays. When Pura discovered there weren’t any books in Spanish for children, she sat down and wrote them. Her stories and storytelling made Spanish speaking immigrants feel at home in the library. She knew if she got them in the door, they would discover rich resources to help them grow their education, skills and careers. She helped transform the 115th Street branch into a vital cultural center for Latinos living in New York. One of the important Latin Americans to visit was Mexican muralist Diego Rivera. 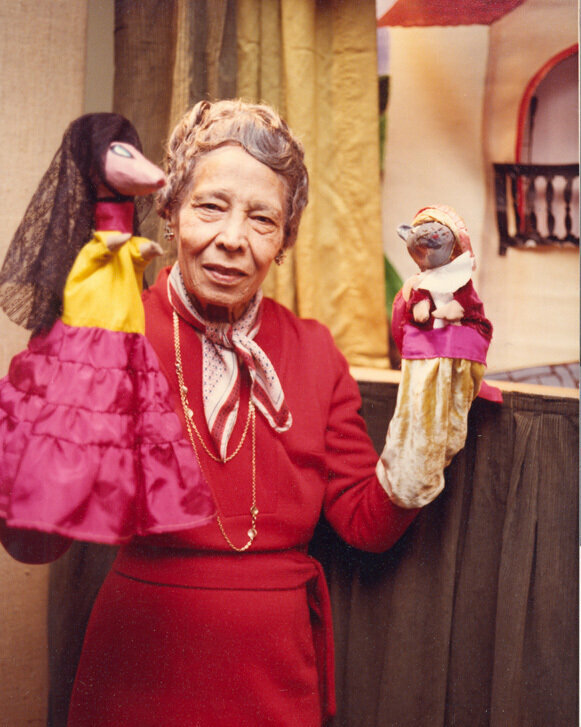 Pura Belpré with puppets from her own story Pérez and Martina. It was the first book in Spanish published by the mainstream press. Pura Belpré married African-American composer and violinist, Clarence Cameron White and left the library to go on tour with him and focus on her literary career. When he died, she returned to the library as the Spanish Children’s Specialist, traveling all over the city to reach large populations of Latino children. Each year, The American Library Association gives the Pura Belpré award to recognize books for kids and young adults by Latino authors and illustrators. At this writing, about 25% of American public school students are Hispanic, yet less than 3 percent of books published for U.S. children are created by Latino illustrators and writers. As an illustrator who has received this incredible award in the past, I can tell you it really does change your life. In the spirit of Pura, the recognition that bears her name, encourages you to keep pushing your craft. It opens doors of opportunity to continue your work with amazing writers and publishers. To connect to libraries, librarians and children. To tell authentic stories with words and pictures.